For the past century, radio has been a one-size-fits-all medium. Turn on the radio and you’re dropped into a show at a moment in time—regardless of what you already know, where you are, or what you’re interested in. Imagine instead if you could have your own radio, one that’s available on-demand, accessible throughout your day, and brings you news about the world and your interests. 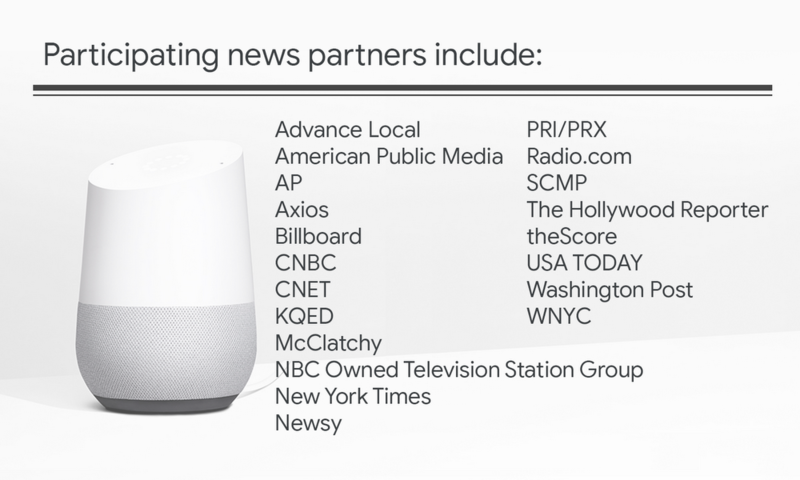 Over the past year, we worked with publishers from around the world—including The Associated Press, Hollywood Reporter, Universo Online and the South China Morning Post—to think through the future of audio news. Together, we built a prototype that brings the artificial intelligence of Google News to the voice context of the Assistant. This new experience will bring you an audio news playlist assembled in that moment, for you. It starts with a briefing of top stories and updates on topics you care about, and extends into longer-form content that dives deeper into more stories. At any point in your day when you want to listen to the latest news—as a morning wake-up, during your commute, or while jogging—the Google Assistant will be ready with new stories and updates to the ones you’ve already heard. Plus, using your voice, you can easily ask the Google Assistant to skip a story, go back or stop. How the new audio news experience with the Google Assistant works. To improve and build out this audio news experience, we’ve built an open specification, available for news organizations that would like to participate. The prototype relies on single-topic stories—segmented out from newscasts or shows—to contribute to the audio news feed. Audio news on the Google Assistant will roll out first to a limited number of people via the Google Assistant in the United States in English. Publishers from around the world who produce English-language content are welcome to submit feeds for inclusion today and sign up to try the experience.